We used to rely on strategical approaches to plan the city. These decisions promised an uniform and homogeneous city environment. 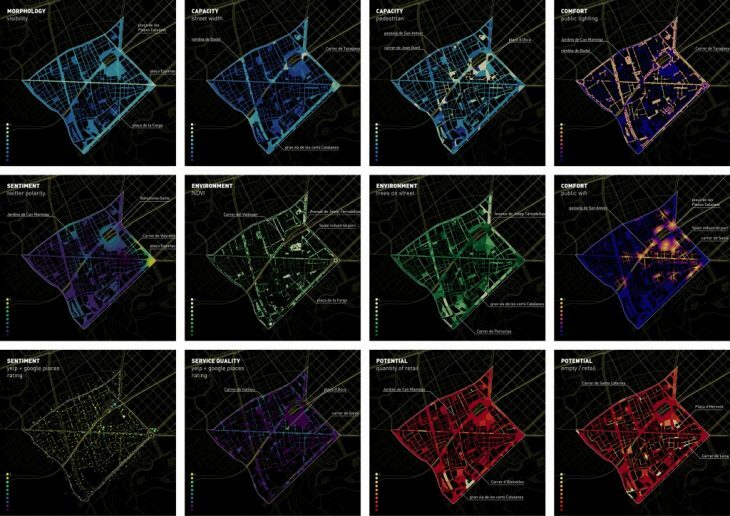 But, the actual paradigm in which our cities are evolving requests more dynamism, reactivity, as well as a more deep comprehension of the intrinsic specificities of each area composing our cities landscapes. However, cities are the result of the complex articulation of multiple factors. This result is sometimes expected, while being the outcome of urban planning decisions, but really often it ends up to be unforeseen. 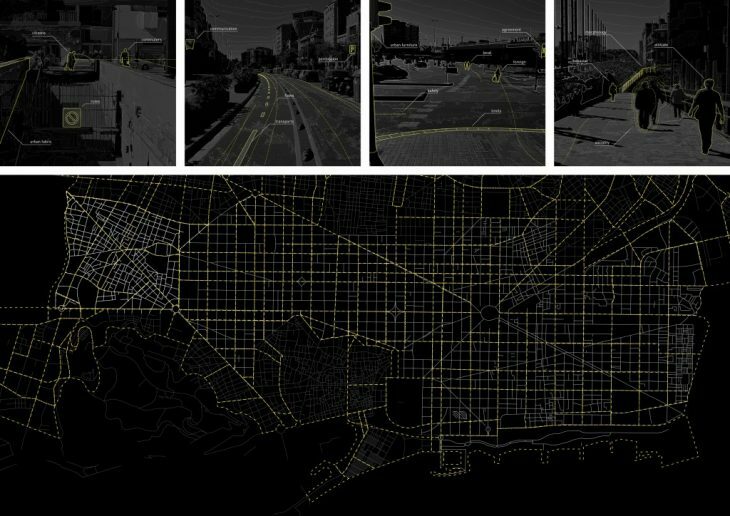 At the same time, the recording of the urban environment is producing a huge amount of information and data that can be difficult to read, to sort or even to access. This complexity can provide an unclear representation of the city and thus, makes the act of decision making clumsy or, in the worst cases, inappropriate. In order to support the tactical initiatives, we felt the necessity of developing a tool for planning, which aims to facilitate and refine the dialogue between the city and its actors. 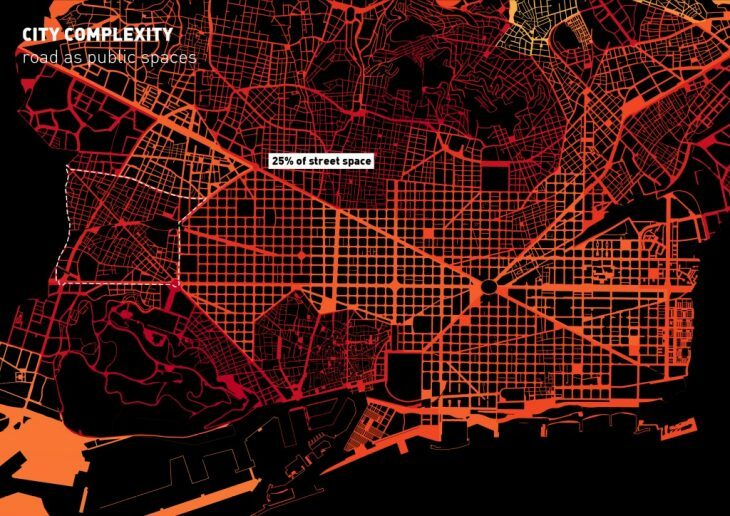 Taking the area of Sants as a pilot, we have implemented a brain interface for the district which is able to collect real time data both from the city morphology and the digital environment of social networks and platforms in order to process specific analysis or simulations and render the output at the scale of a 5m by 5m pixel. 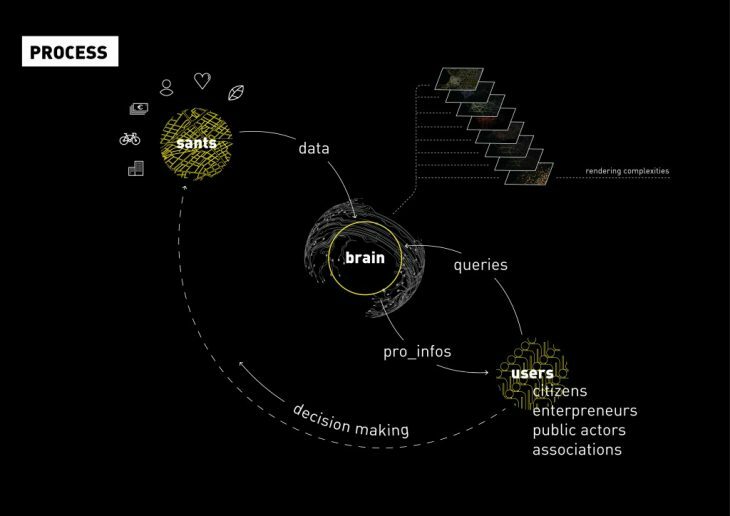 In its actual state, the Hey Sants brain collects data to feed a set of 25 layers of criteria that can be organize in 6 categories : urban morphology, comfort, environment, citizens sentiment, commercial activities and flows. By using a common ground to store the data (the pixel) and a normalized score between 0 and 10, the brain is able to overlap these 25 levels of analysis into conceptually ranked maps of the district for the best understanding of the issue under exam. 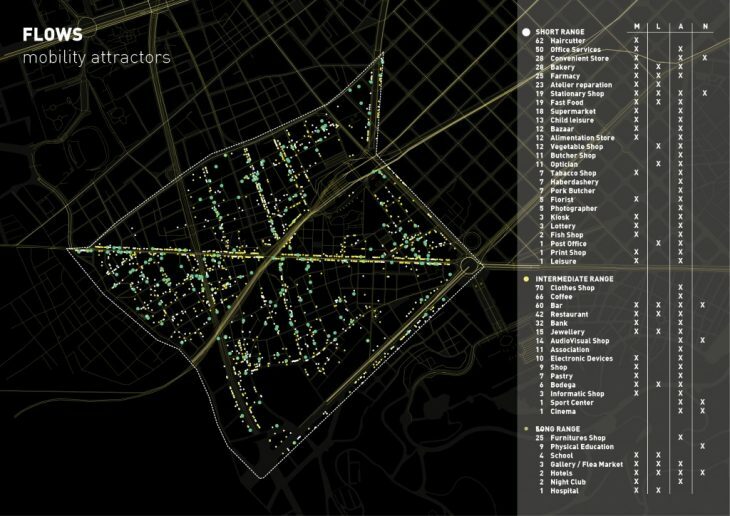 By doing so, this tool is apt to quantify the quality of the public space in order to inform and to guide the act of decision making upon the city. More than just using the data available on open data platforms or API, we developed new indicators based on prediction and simulation. Analyzing the commercial offer of the neighborhood, we speculated the amount of people that could be attracted by these activities, thus, the amount of people that could use the public space to reach these points of interest. 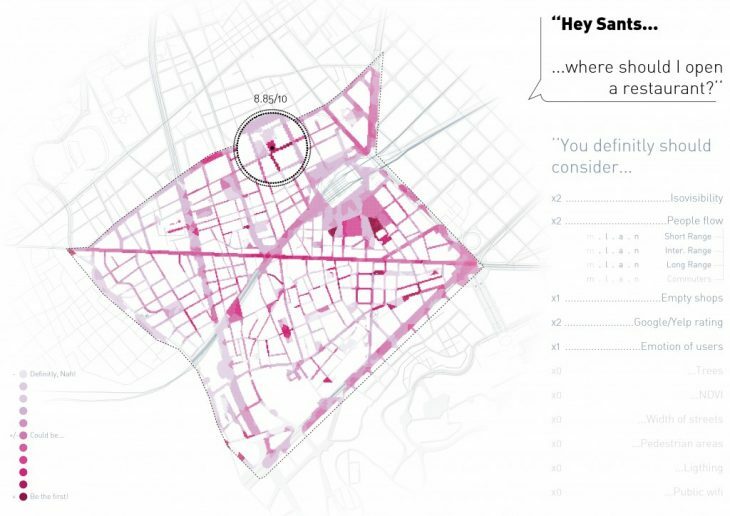 From the analysis of these attraction points, and their ranges of influence we were able to simulate the flow of people motivated by commercial activities, in the district of Sants along the day. Following the same approach, we simulated the flow of commuters in the district. The highlighted areas are representing the portion of public space that are expected to be the most used along the day. This district brain would, ideally, be centralized and put under the responsibility of the municipality. It would be the best option to make the tool freely accessible by every actor of the city, from public services, to urban planners, entrepreneurs or even citizen. In order to suit in the best way the various panel of applications that can have this tool, the access of the data collected and/or generated by the system will take different forms. From the raw data accessible as CSV tables or Shp Files for planners or public services to easily interactive maps for non-professional citizens directly accessible from an online platform. Following this ambition of making complex information accessible to anyone, the final form of the tool would embed a system of word recognition, which would be able to understand a user’s request in order to propose a selection of layers, weighted by coefficient and attributed by the importance that each layer is suppose to have related to the initial request. Finally, the user would be free to adjust the selection, the weight of each layer as well as their polarity. To conclude, Hey Sants helps actors of the district to orient their tactical initiatives towards a more accurate and meaningful response and, in this sense, it acts for a more efficient way of improving our city.